John Boos butcher block has been around for over 130 years and has been used in residential gourmet kitchens and commercial kitchens alike. But butcher block is not just for kitchens anymore! It’s finding its way into other rooms of the home. Perhaps it is the current DIY craze shared through Pinterest lovers that inspire people to create differently. And maybe it is the rise of the rustic-chic and mid-century modern influences that affect home décor now. But whatever the case, no one is going to stop you from taking butcher block out of the kitchen and into the rest of your home. Looking around my house, I see I have more butcher block in other rooms of my home than I do in my kitchen! Sure, I have butcher block cutting boards, and a while back we featured our DIY walnut butcher block kitchen table. But I also have 15 feet of walnut edge grain butcher block countertops in my home office; over 8 feet of maple butcher block workbench in the garage; and a lovely walnut end-grain butcher block table in a guest bedroom. I know I have access to more butcher block than the average person, but the point is that with a little imagination you can easily design butcher block into other rooms of your home. Our most recent project is this hunky end-grain butcher block we made into a handsome coffee table for our living room! The impetus behind this project started with our 68 pound dog, Kirby, who jumped on our leather sectional and put a huge hole through the cushion. Now granted, it was an old couch, but it happened to fit perfectly in our living room; so much so, that we had it re-upholstered and re-stuffed three times over the years. We did end up replacing the sectional with two new mid-century modern couches. But then it was clear that our coffee table did not match, was very beat up and was 4” higher than the new couch cushions. So, we needed to replace it, too. Inspiration for our new DIY coffee table came from a number of places, one of which was from our customer, Kaleb, who built a coffee table for his home from a 4” thick end grain butcher block. For our project we used a 7” thick standard size John Boos maple end grain butcher block, 36” x 25” that had been returned with some shipping damage on two corners. The damage did not affect the integrity of the piece, but it made the block unsightly and not saleable. If you are going to make a DIY butcher block coffee table, we recommend you purchase it unfinished, to save yourself prep time. In our case, we had an end grain block that already had a mineral oil finish. Because we didn’t want to oil our table every month, we needed to eliminate as much oil as possible from the wood. We let it dry out and then wiped it with denatured alcohol. We also spent a fair amount of time sanding the block with both a belt sander and an orbital sander to lessen the crushed corners. That also helped remove some oil and our sanding was successful in removing/hiding most of the damage. We decided to router all edges, including the top, bottom and corners with a ½” beveled (Chamfer) edge which removed enough wood to even out the damage. The most challenging part of this project was in trying to maneuver this 175 pound block! The existing furniture in our living room is cherry stained and we wanted our natural maple end grain coffee table to blend in, so we chose a cherry finish Danish oil (DeftOil). Then we applied urethane finish to seal and protect (General Finishes Arm-R-Seal Oil & Urethane Topcoat – Satin finish). Given this butcher block weighs 175 pounds we needed legs that were not only stylish, but also strong enough to support it. We like the look of hairpin legs and think the style blends nicely with our mid-century modern couches. We determined a 9” leg would bring our table to the exact height we needed and we sourced them from DIY Hairpin Legs, ordered a set of four ½” thick steel hairpin legs in jet black color, and were very pleased with the quality. Here is the completed table. Feel free to comment and share with us your ideas for incorporating butcher block into other rooms of your home! Live Edge Table Project Featuring Wood Slabs from Created Hardwood Ltd.
Today we are featuring our new line of Live Edge Table Tops from Created Hardwood with a special guest post from the owner of Butcher Block Co., Mark Shook. We love all the photos showing the whole process. Read on for all the details plus the beautiful finished product. Thanks for sharing, Mark! My wife had been bugging me for a long time to upgrade the simple (and admittedly cheap and homely looking) desk squeezed against the wall of our master bedroom. I was open to the idea, but uninspired by the computer desks and narrow tables I came across. But once she discovered the live edge tables that we had added at Butcher Block Co., we had our solution. Both my wife and I loved the idea that we could own a one-of-a-kind, all-natural piece of furniture that would look as though it were custom-made to fit our exact needs. We searched scores of great-looking maple and walnut slabs, but since our bedroom furniture is dark, we narrowed our search to walnut slabs. Sure enough, we came across a long, narrow specimen of just the right length and width that was simply gorgeous. Next, we turned our attention to selecting a base to support the table top of our dreams, and zeroed in on the Points base design. We selected the Bronze finish, which we expected would complement the dark browns in the live edge slab and in our bedroom, knowing this would extend the delivery date but feeling good about the trade-off. We were assured that the slab and heavy metal legs would be well protected during shipment. When the massive wooden crate finally arrived, I realized they weren’t kidding! It took an hour to remove dozens of wood screws to disassemble the crate, but I love that I now have all this extra wood for various home projects. Here’s a view of the shipping crate with its top and one end removed. You can see how much time, care and attention the packers put into protecting not only the slab, but the metal legs beneath it, as well. Once I removed the protective top layers, the holy grail was revealed to me. There, in all its natural glory and wonder was the prize I coveted for weeks. After carefully moving our new, prized possession into the master bedroom, my wife and I returned to our newfound treasure chest to retrieve the base. Four bronze Point legs were secured by yet more screws to wooden braces that prevented them from jostling that could possibly mar or scratch them. Now it was time to begin assembly. Surprisingly and pleasantly, this proved to be the quickest and easiest step in the entire process. The folks who salvage and finish these live edge slabs – Created Hardwood – pre-drilled holes into the underside of the slab, inserted metal screw inserts into the holes, and even labeled the four Point destinations, as well as the corresponding legs (A, B, C and D). Using the Allen wrench they supplied, I installed all 16 screws in a matter of minutes. My wife and I could not be more pleased. Thank you Created Hardwood — a great addition to the Butcher Block Co. collection! We love when our happy customers show off their beautiful butcher blocks! This week we are highlighting two gorgeous island upgrades, one featuring a standard size John Boos Blended Walnut top, and the other using custom Butcher Block Co. American Cherry Plank-style butcher block. Both look beautiful and add warmth and function to the kitchens. The first of our happy customers is Rachel from Colorado. 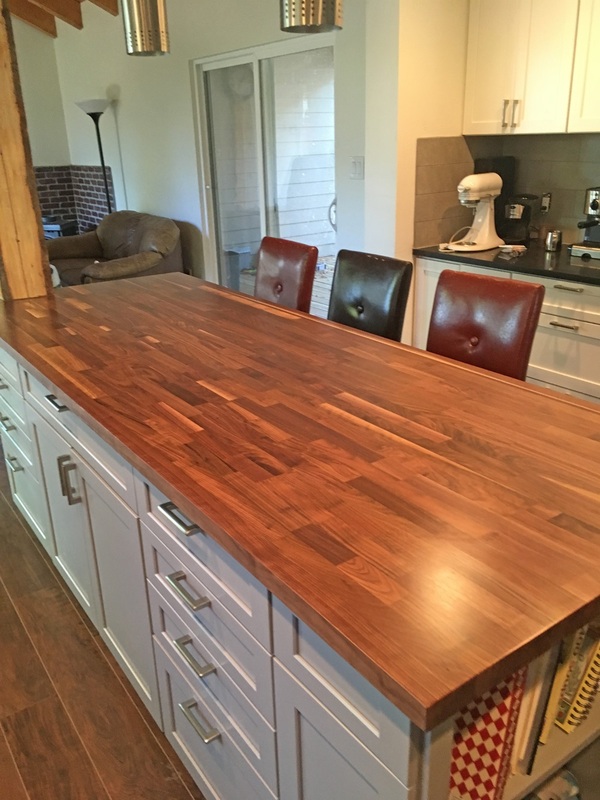 Rachel’s 97″ X 36″ Blended Walnut island top has a Varnique semi-gloss finish, which is ideal since this is being used as an eating area as well as extended work space. What an impact! Happy customer #2 is Teri from Tennessee. 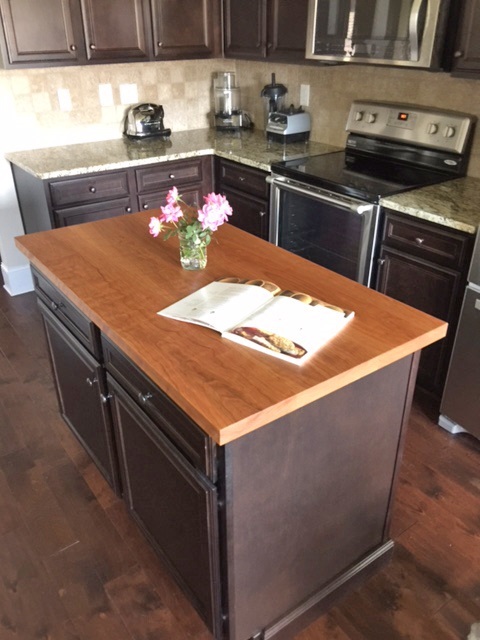 We worked with Teri extensively to find the perfect style and fit for her kitchen island. This plank-style American Cherry block is a unique and beautiful accent to her kitchen. Having chosen the natural oil finish, Teri can use this block for all her chopping and food prep. Teri’s project proves it is worth it to put in a little extra time and effort to get things just right – it looks fantastic! We want to see what you’ve done, too. The more happy customers, the better! Send us your photos and we may feature you on our social media pages. We love to see them, and so do our other customers! 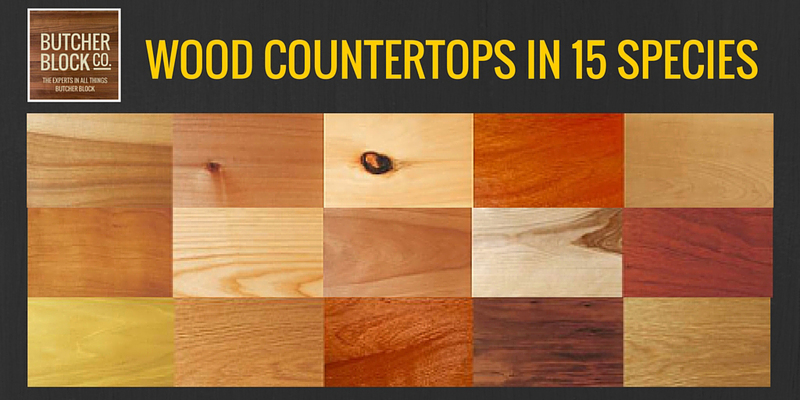 We sell a lot of butcher block countertops to DIY homeowners, contractors and designers. As “the experts in all thing butcher block,” we are happy to share our knowledge and tips to all of our customers and readers. Probably the MOST IMPORTANT ADVICE we can give you about your butcher block countertop, is how to install it correctly! I can’t emphasize enough, the importance of these 5 things to know BEFORE installing butcher block countertops. A very important consideration when installing butcher block countertops, that even some contractors forget about, is to be certain to DRILL EXPANSION HOLES IN THE BASE that will support your butcher block. WHY? It’s important to allow a butcher block to adjust to its new environment prior to installation, to prevent cracking or splitting. At least 72 hours prior to installation, place the countertop in the room where it will be installed. Do not place it directly on a floor or table to acclimate as this could cause warping. Instead, place the block on 2 x 4s set on their ends and spaced 12 to 18 inches apart. This should allow air to flow freely across the butcher block’s top and bottom. WHY? Expansion holes will ultimately allow the installed butcher block to “float” or slightly move as it will want to do with changes in temperature or humidity in the surrounding environment. Using a 3/8” bit, drill expansion holes in the sub-top, or base cabinet near the corners where the butcher block will be attached. Tops installed without expansion holes will likely NOT be covered under warranty. WHY? Screwing into butcher block without pilot holes might crack the wood! Place the countertop in position. On its underside, mark the location of each expansion hole and drill pilot holes into the top’s underside using a 5/32” drill bit. Make the pilot holes only deep enough to accommodate the full length of the screws you selected. General rule is, the screw should be only long enough to go 1/2 way into the thickness of the block. Place a washer on a screw and drive the screw upward,from the underside of the sub-top, through an expansion hole and into a pilot hole. Make sure the washer is large enough to cover the expansion hole. Do not over-tighten the screw. Repeat the procedure for each expansion/pilot hole. WHY? Glue anchors the wood too tightly and might cause it to crack and warp sometime after installing butcher block. Do not glue your butcher block to any supporting structure. Because wood will slightly expand and contract with changes in temperature and humidity you must allow it to move. While silicone glue is more pliable, it is still not recommended. Any resulting damage from using glue will likely NOT be covered under warranty, so don’t take any chances. WHY? Butcher block needs “breathing” room on all surfaces, given it will slightly expand and contract with changes in temperature and moisture. The standard procedure for mounting countertops is to place them over the base kitchen cabinets. If you are remodeling, be sure to remove the prior kitchen countertop completely before you mount a butcher block countertop. If it’s not possible/practical to remove underlayment such as particle board or MDF, cut large holes in it to promote ventilation. Please reference this blog post before installing butcher block countertops to help prevent damage and keep your warranty in place. Plus, view our detailed installation instructions for John Boos butcher block countertops. Visit our website to see our standard size butcher block countertops or use our online instant quote tool for pricing custom butcher block countertops from John Boos and Butcher Block Co. I get to work on most of our custom butcher block projects, so when we get pictures back from happy customers, it really makes my day! Remember the speed bag platform made from a butcher block table top? I’m not sure we’ll ever top the uniqueness of that one, but I’d sure love to see you try! Even in traditional applications, I’m always stunned by the amazing work our customers do, and I love that you all appreciate the beauty, warmth, and function that butcher block can bring into the home. 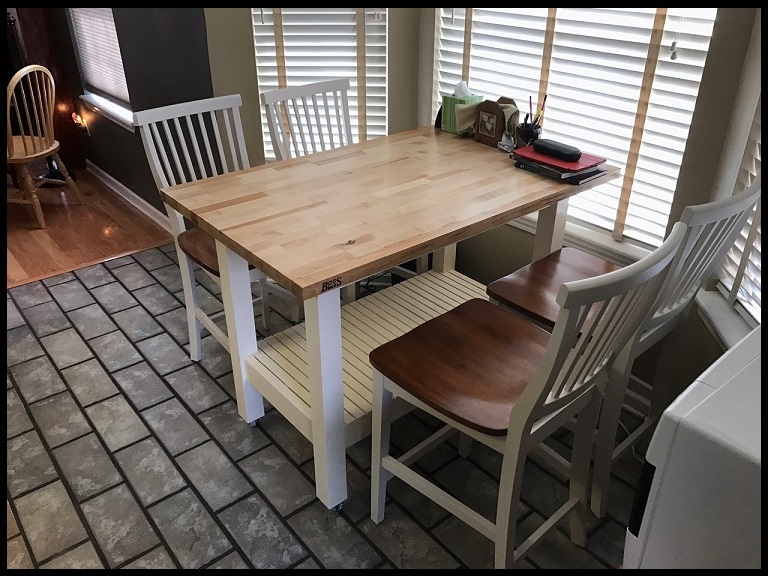 Recently, we received photos of three beautiful uses for custom butcher block. Jerry in Georgia upgraded his workspace with these gorgeous desks made from John Boos Walnut custom butcher block with custom commercial grade stainless steel bases. These bases usually come with commercial grade Maple tops, but we had Boos put together this custom design and it looks so sharp! Since he is using these as desks, Jerry elected to go with the Varnique semi-gloss finish, for a smooth, maintenance-free surface. Over in Arkansas, Tom and his wife built their own table base and used a custom butcher block for the table top. This John Boos Blended Maple top also has the Varnique semi-gloss finish, perfect for easy clean-up on a dining table. Isn’t this fantastic? I love the base and I’m so glad we could get the perfect size top for them. Now let’s head way down south to Key West, where James has crowned his island with a stunning Butcher Block Co. Walnut Plank Style custom butcher block top. He asked for a “showstopper,” and boy did he get one! The plank style allows for wider sections of wood, which really show off the beautiful grain pattern and natural color variation of the Walnut. I think everyone should have one of these! If you would like to explore the idea of adding custom butcher block to your home, give us a call or shoot over an email. We love working on these projects and seeing your creative ideas! Perhaps you know exactly what your design style is. I don’t think I have one particular design style that I follow in my home. Maybe it is because I have lived in my house for 20 years and did not have the luxury of buying all my furniture at one time. So, instead, my furnishings reflect my taste when I acquired the pieces and when I was in that particular phase of my life. However, overall, I would say it ties together and it would likely be described as a Mid-Century Modern design. I do admire many design styles, especially when they are well thought out. Whether I am browsing through furniture showrooms or visiting friends’ homes, I tend to really love a well-designed space. I think coastal design is perfect for summer cottages. I appreciate the charm and comfort of a farmhouse design. I love the simplicity of arts and crafts furniture. And oddly, I find the industrial look to be very intriguing and almost nostalgic. But bottom line, I am most comfortable in my home because it is streamlined and uncluttered, with warm wood tones and natural accents like stone and copper. Given we all tend to spend much of our free time in the kitchen, gathering with friends and family, it is no wonder that the kitchen has become a natural extension of our living room. And as part of this extension, it has become trendy for kitchen furniture and design touches to complement the furniture and design styles in the rest of our home. Whatever your design style, there is butcher block kitchen furniture that can easily complement your home. Here are ten popular styles and some butcher block furnishings that could complement that particular design space. Arts & Crafts – simple forms often showing how pieces and materials were put together. Coastal – inspired by the ocean, light and breezy feel, accessorized with nautical themes. Contemporary – sleek clean lines, often accented with metal frames and straight legs. Country – or farmhouse, has a rustic elegant look, with natural wood and/or white bases. Eclectic – evokes a sense of imagination, with lots of color, shapes, textures and patterns. French – ornate and decorative in style, with an antique furniture look. Mid-Century Modern – style characterized by simplicity, functionality and natural shapes. Modern – a clean, minimalistic style, often incorporating polished or metal surfaces. Shabby Chic – antique looking furniture, featuring a painted, distressed look. Industrial – rustic and mature looking with the use of wood and exposed steel. Walnut butcher block has become incredibly popular over the last few years, and we totally understand why: it is GORGEOUS! A while back we had a customer who needed to exchange his blended walnut butcher block countertop for a different finish. The top was 107″ long and absolutely beautiful, and it just so happened to be in Phoenix. A couple of us here at Butcher Block Co. decided we could find use for this beauty, so we each embarked on a DIY journey to create our own masterpieces. We hope these two projects will help inspire you to bring walnut butcher block (or any butcher block) into your home! About 10 years ago I inherited a kitchen island that was originally used as a store display, and I have wanted to refinish it ever since. I got as far as replacing the wooden knobs with cute ceramic ones, but the improvement wasn’t exactly notable. The biggest problem was the top. It was cheap and too soft to use as a butcher block, not to mention completely unappealing to my tastes. Thankfully the perfect solution presented itself in the walnut butcher block being exchanged by our customer. It was already the ideal depth at 30″, and I only needed 51″ in length to give my island a nice 2.5″ overhang on each end, expanding my work surface a bit more than the previous top. After a couple hours of wrenching the original pine top off my island (seriously, there were something like 18 screws…a little overkill! ), I was able to start sanding the base so it could be painted. Unfortunately I do not possess quite enough upper arm strength to power sand 25 years of buildup off a table base, so I enlisted some help at this point. I bought some spray paint in a nice almond shade, went out of town for a week, and came home to a fully transformed kitchen island (do I have the best dog-sitter/friend or what?!)! The oil finish already on this block was the right option for me, as I am using this as a prep table to do all my chopping. My favorite part of every month is when it is time to oil my block – there is just nothing quite as beautiful as a freshly oiled walnut butcher block. My ugly old island has become one of my most prized possessions. My son was moving into his new home and we gifted him the oak breakfast nook my husband designed 25 years ago. It was a perfect excuse for us to finally upgrade to the kitchen table of our dreams. We have always wanted a bar height kitchen table to match our dark mahogany colored kitchen cabinets. And luck would have it, we were able to repurpose this blended walnut butcher block countertop that was returned to Butcher Block Co. Using the “other half” of the top Candice used, we were able to make a kitchen table 59”L x 36”W. We started with an oil finish blended walnut top, our “half” was 56”L x 30”W x 1.5”. We sanded it down to completely remove the oil finish that was applied at the factory. This table was a little small for us, so we added a 3” mahogany rail on the sides and a 1.5” wide rail on the ends using a biscuit joiner. We chose a 3” thick rail of mahogany so that the finished table appeared to be a chunky 3” thick, even though the butcher block was just 1.5” thick. Further sanding smoothed out the seams. We did not have any desire to cut upon this butcher block, so we decided to stain it to match our cabinets, using a Zar brand wood stain. And because we were looking for a low maintenance table top, we knew we wanted to go with a polyurethane finish, applying 4 coats to the top. The base of our table consists of 2 bar height metal disc bases. We hired a family friend to weld the custom foot rest that attaches to the metal base. Then we sent the bases and footrest to a local business to powder coat them to match the metal on our bar stools. Our finished table is gorgeous. The walnut colored stain brought out the beautiful grain patterns in our blended walnut butcher block. And this top is so low maintenance that all I need to do is wipe it clean and use Pledge on the top to keep it looking new. 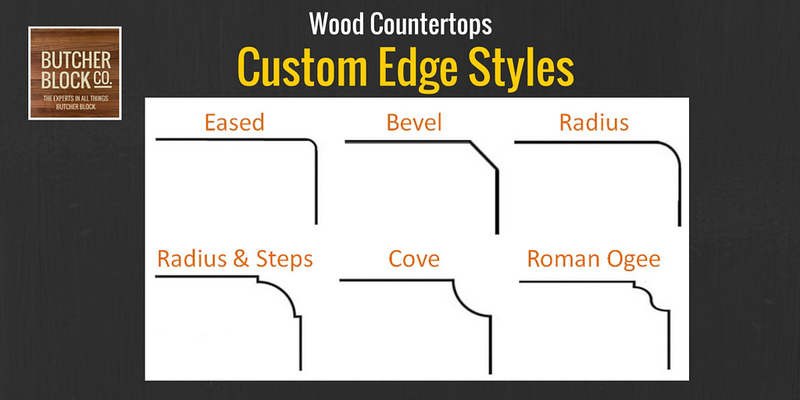 New Countertops You’ll Love – Let Us Count the Ways! As you have probably noticed, we recently introduced a new line of countertops. Butcher Block Co. countertops are available in 15 different species, providing you with a wide range of aesthetic choices and expanded sizing options. The variety of wood species, size, edging, and finish options means you are sure to find something that will work for your project! As more homeowners are choosing to take on remodeling and renovation projects, the introduction of Butcher Block Co. countertops has come at the perfect time. According to Consumer Affairs, spending on home remodeling projects is expected to increase by 9.7% by early next year, and one of the best opportunities for return on investment is updating the kitchen. We love our John Boos countertops in Blended, Edge, and End Grain, but we know our customers are sometimes looking for something a little different. With expanded sizing options in length, width, and thickness, Butcher Block Co. countertops offer solutions for very small and very large projects that we previously could not accommodate, and with faster turn-around times, too. Sometimes our customers are simply looking for a beautiful wood countertop and are not interested in using it as butcher block. Our large selection of species provides choices for heavy use (Maple, Hickory, Mahogany) to light use (Knotty Pine, Alder, Spanish Cedar), so you can find a beautiful countertop no matter your needs. 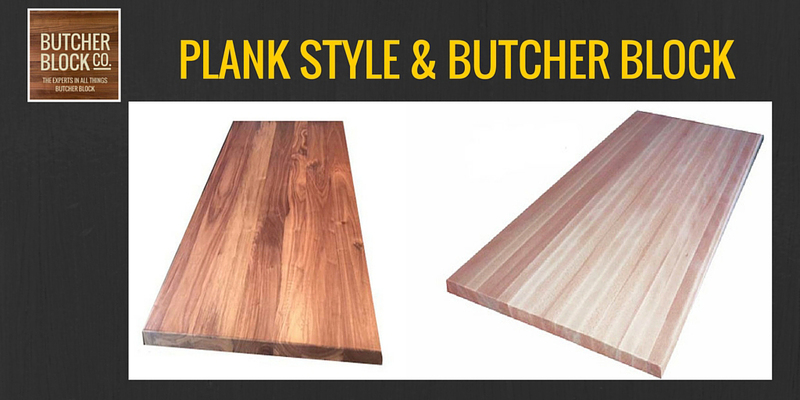 While Butcher Block Co. countertops are also available in the traditional butcher block styles of Edge Grain and End Grain, our most popular has been the Plank Style. With face-grain boards ranging in width from three to six inches, Plank Style countertops offer more of the natural character of the tree. The last several years have seen a boom in natural elements being used in the kitchen to bring warmth to modern design. The addition of plank style countertops has come with a new set of customers who appreciate the broader visual picture of the grain pattern and natural color variation offered by these tops. Customers who are seeking an even more rustic look can opt for a hand-scraped finish on either plank style or edge grain countertops. The hand-scraped finish is achieved by running a scraper along the length of the top, creating slight variations in the surface. In Red and White Oak, you may also choose a quarter-sawn option, which showcases the rings of the source tree and provides a unique look and superior stability. Further customization can be found in our eight different edge options ranging from a sanded square edge to the classic small or large Roman Ogee. Butcher Block Co countertops are made-to-order and take 2-3 weeks for production, depending on your choice of finish. Unfinished tops ship more quickly, and will need to be finished on-site right away. This is a great option should you elect to stain the top to your liking. Oil and varnish finished tops will arrive ready for install. We are delighted to offer these new options to our customers! If you have any questions, please feel free to email us at [email protected] or give us a call at 877-845-5597. Since its inception, Butcher Block Co. has focused on selling other manufacturers’ branded kitchen goods on its high-traffic website (https://butcherblockco.com), most notably, kitchen countertops, furniture and cutting boards made of butcher block and manufactured by longtime industry leader, John Boos & Co. But the online store announced today that for the first time, it will offer products for kitchens under the Butcher Block Co. brand name. Asked if company plans call for more product launches under the Butcher Block Co. brand name, Kathleen Grodsky, BBC’s VP of Marketing, shared that, “Butcher Block Co. is becoming recognized and trusted by enough American consumers, online shoppers in particular, that it makes good business sense to offer “store-brand” products, just as leading big-box retailers do, especially if they complement our current offerings.” According to Shopper Approved, a third-party collector of online shoppers’ store reviews, verified purchasers have given ButcherBlockCo.com an overall satisfaction rating of 4.9 out of 5. About the company: Butcher Block Co., an online seller of kitchen furniture and cooking and serving accessories, is an authorized dealer for such leading manufacturers as John Boos & Co., Catskill Craftsmen, Oasis Concepts, Chris and Chris, Artelegno and Chroma. The company’s primary lines include butcher block countertops; kitchen islands, carts and tables; and wood cutting boards. 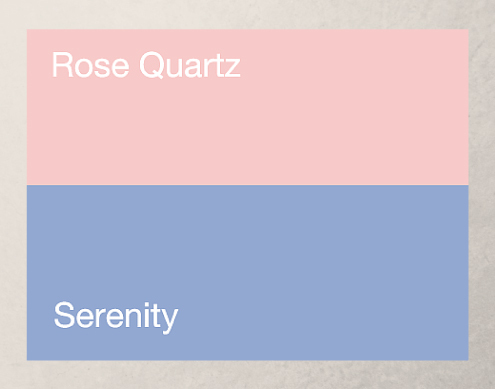 The 2016 Pantone Color of the Year is actually a blending of two colors, warm Rose Quartz and cooler Serenity. This reflects peoples’ gravitation toward soft calming colors as they seek wellness in the new year. Maybe I was ahead of the trend two years ago when I painted my master bedroom a lighter shade of Serenity because I was absolutely seeking a calming, spa-feel in my bedroom. If you recall, last years’ color of the year was Marsala. While I loved the color for the fashion industry it was not my favorite color in the kitchen. And again, this year I would not go out and paint my kitchen rose or light blue (although there is mention of a deeper blue making an appearance in walls, surfaces and appliances in 2016). Kitchen color trends for this year include texture and contrast such as a light and dark color mix between cabinets, walls, countertops and flooring. And accent colors make a splash with pops of color on neutral backgrounds. So the kitchen trends include soft neutrals like classic white, creamy white, tan and soft gray as backdrops for adding color and visual texture. Cabinet trends include finishes that highlight the natural wood grain. The paint experts announced shades of white as their color choice for 2016. The Sherwin-Williams Color of the Year is Alabaster which “provides an oasis of calmness, spirituality and ‘less is more’ visual relief”; The Benjamin Moore Color of the Year is Simply White. White and grays have become so popular in the kitchen that they are no longer trendy, rather they are now considered classics. These neutral palettes provide for endless design opportunities. John Boos “classic white” Butcher Block Tables include the Calais, Jasmine and Grazzi. Clean, contemporary lines continue to dominate kitchen design. A contrast in materials and textures is apparent throughout the kitchen. From floor to ceiling different finishes mix lighter and mid-tone grains with neutral backgrounds. No longer is it necessary to match your wood species or grain styles. Color is deliberately being used to make a statement; deep rich reds, greens and blues for walls and kitchen islands; or just a punch of color used sparingly in neutral kitchens. Are you remodeling your kitchen in 2016? We can help you discover the right Butcher Block furniture or countertops to fit your style and decor. Give us a call at 877-845-5597 or visit us at www.ButcherBlockCo.com. We are happy to assist!